After a feasibility study, Repsol YPF decided to apply a model-based predictive controller to a batch reactor producing polyols. The predictive controller for reactors (PCR) is a set of control modules that are designed to face most of the reactor configurations. The important increase of production is a consequence of the better handling of the reactor temperature. Here's a description of the unit and control objectives, methodology, project steps, results and the corresponding benefits. The Chemicals Division of Repsol YPF operates a large petrochemical complex in Tarragona, Spain. Among the plants of the facility, a polyols reactor (Fig. 1) has been selected by the producer as a good candidate for a control technology able to significantly improve stability of the unit. This reactor is operated in fed-batch; a first product is introduced into the tank and heated. Then, while several reactants are injected, the exothermic reaction requires efficient cooling to respect a temperature setpoint and avoid reaching a too-high limit. Low enough to keep it far from the high limit because of the usual temperature fluctuations. The product is heated by steam injected into a coil inside the reactor tank. Product cooling is obtained through a heat exchanger that circulates cooling water. The actuators (steam and water cooling valves) have very different dynamic effects on the reactor temperature. Once the product is heated in the tank, the reactant is injected into it and produces an exothermic reaction. The reactor temperature must be controlled at a constant set point during that injection. In case the temperature gets too high, the injection flowrate must be decreased. 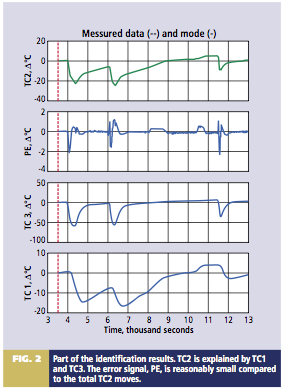 Link between the actuators and the temperatures is integrative with time delays. 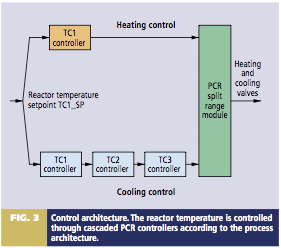 Heating and cooling actions affect reactor temperature with very different dynamics, which limits performances of the usual split-range control. Nonlinearities in the manipulated variable require a specific controller. Decrease of marginal costs through smaller consumption of utilities. Model-based predictive controller technology and tools. 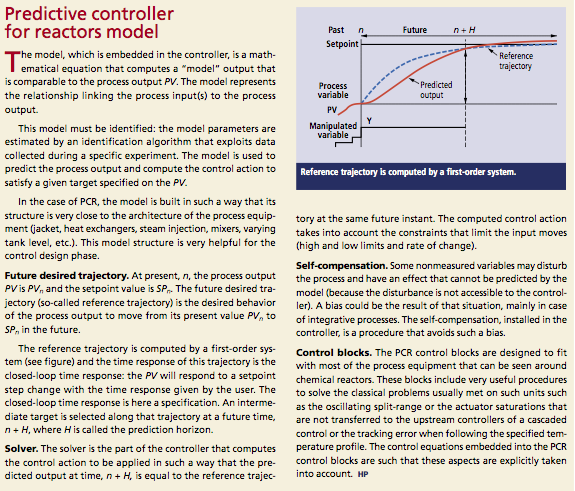 The proposed technique, PCR, is a model-based predictive controller. The methodology relies on a dynamic model of the process to be controlled. The estimated model, describing the relationships between the manipulated variables (actions) and the temperatures to be controlled, makes possible predicting behavior of these temperatures and computing the actions to be applied to the unit. PCR is a set of control modules. Some are specific to chemical reactors such as temperature profile tracking. These control modules can be used profitably on this reactor since the performance of traditional PID controllers is not good enough. This is generally the case if the process is integrative, if there are some measured disturbances and the dead-time is important. The PCR modules are designed and programmed in such a way they can be easily embedded into PLCs or DCS boards. The first project step is to establish the model structure corresponding to the architecture of the equipment of the unit: jacket, heat exchangers, mixers, heat device, etc. 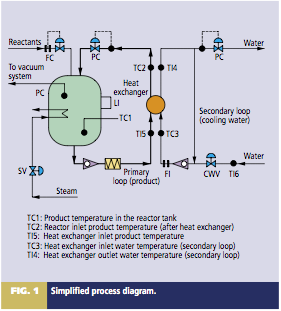 The model parameter values are then estimated from data recorded during specific plant tests: voluntary moves applied to the heating and to cooling actuators when the reactor tank contains dead load (see example Fig. 2). When the reactant feed rate is measured (which is the case in the present project), it is considered a feed-forward variable and its effect is also identified from collected data during regular batch runs. The controller is then designed (Fig. 3) and applied on a simulation of the process based on the identified dynamic model. Simulated closed-loop and robustness tests are performed to ensure that the controller keeps on running with acceptable accuracy even in case of process-model mismatch. After its integration into the control system, the designed controller is validated. Then the global controller is applied progressively to the real reactor. 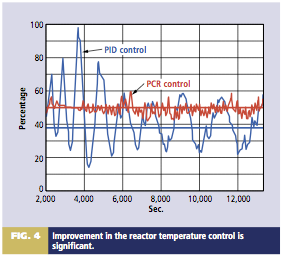 The improvement in the reactor temperature control is significant (Fig. 4). The fluctuations were reduced at least by half. That makes it possible for the producer to increase the temperature set point closer to the high constraint. This improvement has an effect on several aspects: less valve movement (longer process availability) and no further competitive actions between heating and cooling (energy saving). Although these items have a non-negligible impact on savings, the most significant benefit clearly comes from the fact that the producer could push the process to its limits thanks to PCR control performance. Another consequence of better unit handling is the capability to perform reproducible operating conditions for the different batches and, therefore, to obtain a more uniform product quality. Ana Sanz is a senior process engineer at Repsol YPF. She has been working in the field of propylene oxide derivatives for 15 years. Ms. Sanz holds a degree in chemical engineering from the Complutense University in Madrid and an MBA from UNED. Alicia Cardete is a process technician at the polyols and glycols plant at the Rep- sol YPF Chemical Division in the Tarragona industrial complex. She has been working in process engineering for eight years including six years in the propylenic derivates plants and two years in chemical metallization in impressed circuit. Ms. Cardete has acquired experience in plant startups. As part of her background, she has worked in a technical center of Procter & Gamble's R&D Department. Ms. Cardete is licensed in chemical sciences, engineering speciality, from the Universitat de Barcelona. Raquel Lucio is currently the process control technician at the Repsol YPF Chemical Division in the Tarragona industrial complex, working in the propylene oxide and styrene monomer plants. She started as a process control technician for Repsol YPF Engineering Central 10 years ago. Ms. Lucio is licensed in physical sciences from the Universidad Autónoma de Madrid. Rodolfo Martínez is a production technician at the polyols and glycols plant at the Repsol YPF Chemical Division in the Tarragona Industrial Complex. He also worked as production technician at the HDPE plant in 1997, and at the Technological Center at SEAT in 1996. Mr. Martínez holds a degree in industrial engineering from Zaragoza University and an MBA from EOI. Santiago Muñoz has been working at the Repsol YPF Chemical Division since 1990 in the area of propylene oxide derivades. He has performed different roles in areas such as: Process technician (in the Puertollano Complex until 1988) and engineering and startup of the polyols and glycols plant at the Tarragona complex, where he is the plant manager. Mr. Muñoz is licensed in chemical sciences from Valencia University with an organic chemistry speciality. Diego Ruiz holds a doctorate degree in chemical engineering from the Universitat Politècnica de Catalunya. He is currently manager of Soteica's European office in Barcelona. Soteica is an independent chemical engineering consulting firm specialized in applying simulation, information systems, modern control technology, and planning and scheduling tools for the process industries. Dr. Ruiz has been working in the areas of process engineering and computer science applications in chemical engineering since 1994. He has experience in industrial applications and research. Dr. Ruiz has worked as a process engineer at Dow Chemical and as a researcher and project coordinator at UPC. His doctoral thesis is related to abnormal situation management in chemical plants. Carlos Alberto Ruiz is a chemical engineer from the Universidad Tecnologica, Rosario, Argentina. He obtained MSc and PhD degrees, both in chemical engineering, from the Universidad del Sur, Bahia Blanca, Argentina. From 1988 to 1994, he worked at PASA (Petroquimica Argentina S.A.) as process engineer, in charge of the advanced control and simulation areas. Dr. Ruiz is professor of chemical engineering (computer applications to process engineering) at the Universidad Tecnologica Nacional. He has been the advanced control and optimization manager of Soteica, a chemical engineering consulting firm with offices in Buenos Aires, Mexico City, Barcelona, São Paulo and Houston. In that position, he leads projects related to model-based predictive control, utilities and process systems optimization, and intelligent systems applied to process industries. Olivier Gerbi is a process control engineer for Sherpa Engineering in France. He is responsible for model-based predictive controllers' development and follow-up. Mr. Gerbi has been implementing SISO and MIMO predictive control (IDCOM-HIECON, PCR) in various industrial sectors such as oil, fine chemicals, food and metallurgy. He formerly worked for Adersa, where he was involved in control projects and control CAD design. Jacques Papon is a senior control engineer for Sherpa Engineering Corp., Nan- terre, France. His duties include feasibility studies and advanced control projects for industrial applications of multivariable predictive control techniques. He performed technology transfers to control systems manufacturers and to several engineering companies in the world. Mr. Papon has prior experience at Adersa, where these techniques were developed 30 years ago.